The essential physiological skill in most cycling events is threshold power. If you are capable of generating many watts at your threshold power, you are likely to be a successful rider. Sprinters, climbers and time trial experts all need a great threshold power. 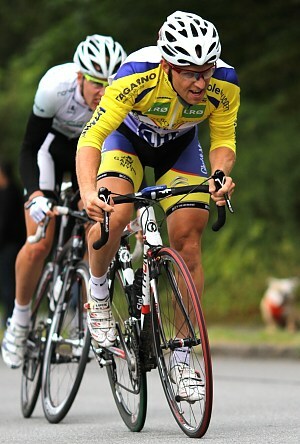 A good performance at threshold power is compulsory for winning a cycling race. Even if you do have a highly trained aerobic system, you cannot be sure of winning. Tactics, technical skills, VO2 max and sprinting prowess also matter, but having a high threshold power makes it unlikely that you will get dropped before the finish line. There are numerous terms describing threshold power: critical threshold power, functional threshold power, anaerobic threshold, AT, threshold power, lactate threshold etc. Most of these terms describe the well known situation: when you ride at a certain speed, you can continue for maybe an hour, but if you ride just a little bit faster your legs will burn up within minutes. I think it is only of academic interest to decide which of these is the most suitable term. Instead I will take you on a guided tour around the concept of threshold power training, including practical examples for your daily training. What do we actually know about Threshold Power Training? It is well established knowledge that training with high intensity improves your ability to continue exercise without accumulating lactate. This physiological skill is often the most determinant factor in endurance sports and that is probably why you are reading this article: You want to learn how to increase your threshold power because that will make you a better endurance athlete. What is the right intensity for Threshold Power Training? Many coaches develop training sessions targeted to improve your threshold power. Intervals with an intensity around your threshold power are the most common and they are very time effective, too. However, there are other ways to train, which will boost your aerobic engine. Even though these training intensities are quite different, they all to some degree improve peripheral adaptations like increased capillary density, more myoglobin, more mitochondrias, better use of free fatty acids as fuel, larger glycogen stores etc. There are many concepts and ideas about how to build threshold power. Most cycling coaches have their own strategy. My training principles focus on the high intensity training methods, VO2 max and interval training. This differs a bit from other successful cycling coaches, but generally most of us achieve magnificent results using a combination of the above mentioned training intensities. Coaches often have a preference for one of these intensities, or maybe they use another term for almost similar intensities. If an athlete with the right talent starts to train using any of the four above training principles and for the required duration of each training session, he will be capable of becoming a professional rider. It might sound controversial, but road cycling is not as scientific as many cycling coaches would like to think. Talented riders who train hard will always be able to ride faster than others. That is why some athletes carve out a professional career without ever using a cycling coach. They train hard, they eat right and they rest – and, of course, are naturally talented. Their training principles probably include more LSD training (Long Slow Distance Training as used by runners) than my training programs advise and I have to admit that these riders become extremely strong (or at least some of them do). I am not sure these riders will ever reach their physiological potential, but they might hit 98% of their optimum performance and that is more than enough to turn them into talented and determined professionals. Thus, it is not only a question about threshold intervals, because there are many training intensities that will increase your threshold power. What is the real secret of successful threshold power training? The secret to becoming a great endurance athlete is consistency. You have to work hard, be focused and be consistent. Not just for a week, a month or a year. You need to put in consistent work over several years to build the necessary endurance to reach your full potential as an endurance athlete. Most professional athletes have a background of more than 10 years’ serious endurance training. This illustrates that one of the most important reasons why professionals are better than YOU, is that they train consistently for several years. Many riders are searching the internet to get a quick fix that will help them get closer to their goals. However, at present there are no legal steps letting you reach your full potential in record time. Please remember that the below mentioned training methods can increase your threshold power, but they all require consistent work for a long period before you will gain significant results. I strongly recommend power meters and heart rate monitors as a part of serious cycling training. It is possible, though, to use all of my cycling training programs and principles without a power meter or even without a heart rate monitor. If you do not have a power meter, please consider to use a good ergometer bike at least for preliminary testing purposes. If the concept of power meter training is completely new to you, here is an introduction to power meter training. The higher intensity you train at, the more benefit you will get from using a power meter. It is extremely difficult to achieve proper pacing at intensities above your threshold power; this is where a power meter could become an appreciated training partner. If you prefer to use mainly LSD principles, it is less important to use a power meter. A heart rate monitor would be just as effective. Intervals close to VO2 max are a potent stimulus for your aerobic system. VO2 max intervals not only improve your VO2 max power, but also provide a great boost to your threshold power. People looking for time effective interval training should definitely include these intervals in their workouts. I normally use VO2 max intervals most of the season because I work with elite riders who need sessions close to maximum oxygen consumption to achieve further progress. Even though VO2 max is not the single most important power output, it is still very attractive to learn this skill because the physiological adaptations to VO2 max training are the same as the ones you achieve with training at lower intensities for example threshold power training. The biggest difference is the time needed to train to achieve the same progress. Example: 3 x (3+3min) at VO2max / recovery. If you use a heart rate monitor, your heart rate should be above 95% of maximum at the end of these intervals. If you use a power meter, your target power could be in the area of 120% of your functional threshold power or even better based on your 5min maximum power. If you want more inspiration for VO2 max training, have a look at my VO2 Max Booster Program. Threshold power interval training is probably the most common way to increase threshold power. The principle is to know your power output and/or heart rate at threshold power and use these values to pace yourself throughout intervals at the same intensity. You will have to do a test or a time trial as a reference. The most difficult part of such an interval is to stay at the right intensity throughout. Going slightly too fast at the beginning makes it impossible to maintain the right intensity to the end. If you go too slowly, you will not get the adaptations you are training for. Threshold power intervals are hard, but very effective in building a solid aerobic engine. Threshold power intervals are also good for becoming better at pacing for triathlons, time trials or breakaways. Example: 3 x (12+ 6min) at threshold power / recovery. Target heart rate should be in the range 88-92%, but depends on how you have performed at previous tests or races with a duration of app. 1hr. Some riders are able to ride with a higher percentage and others are not able to make this range. The best method to find out is to ride 40km time trial or participate in a criterium. If you use a power meter you can use your functional threshold power from one of the above mentioned events to calculate your functional threshold power. VO2 max intervals and threshold power intervals are the two most time effective ways to increase performance. But there is one major problem: high intensity intervals only work when you finish them. If you do not manage to maintain the correct intensity throughout the interval session, the effectiveness decreases. You will achieve better training if you choose an intensity with a higher success rate. It is my experience that the success rate of high intensity intervals is lower than sub-maximum intensity intervals. Still, sub-threshold power intervals can still offer significant improvements when made in appropriate doses. Also there is an argument that there is a physiological sweet spot because you can train at quite a high oxygen consumption without going anaerobic. Thus, you will give a great lift to your aerobic system (and almost nothing to your anaerobic performance). Example: 4 x 15min slightly below threshold power. If you use a heart rate monitor, try to stay 5-10 beats below your threshold heart rate. If you use a power meter, these intervals could be done with a power output at 90-95% of your functional threshold power. As sub-threshold power intervals can improve your aerobic system, endurance training with lower intensity can also make improvements. You just have to work for a much longer time to achieve the desired progress. I know many of you will consider this impossible, but please keep in mind that real LSD training for many years has proven to make great athletes. Example: 4 to 8hours at moderate or lower part of sub-threshold intensity. Power meters and heart rate monitors can be used for pacing, but often it is more a feeling of comfortable pacing throughout the distance. What is the best way to increase threshold power? It is a difficult question and I think there is no answer that fits all. My personal belief is that a combination of VO2 max and threshold power intervals are necessary for highly trained riders (professionals/elite) to make them reach their physiological potential. Even though I give these two methods a little plus, I admit that your success rate when you try these intervals is crucial. If you miss the intervals too often, it would be better going with either sub-threshold power intervals or endurance rides. I think that for most riders, the most secure way to build threshold power over time is to use a combination of all 4 training methods with sub-threshold power intervals as the most frequent interval training session. Ok, you have managed to read this far and I guess you are now very inspired to design some great workouts that will help you to increase your threshold power. Time Effective Cycling Training is the culmination of my years of experience training some of the top cyclists across Denmark. The e-book is designed to help road cyclists, mountain bikers and triathletes to reach their full performance potential. 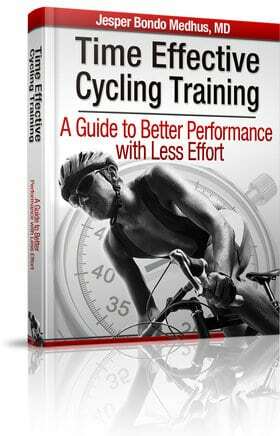 Time Effective Cycling Training is not a miracle cure or a “quick fix”. Instead, readers will get an insight into intelligent and proven scientific training principles that will accelerate their progress. It takes a long-term view: that you can get faster by training less. Boost your threshold power now! Great article Jesper. I have one question. What recovery period would be recommended between efforts for the Sub-Threshold Power Intervals? 5-7 minutes, perhaps? I don’t think it is that important to consider recovery periods between long sub-threshold intervals. In theory it would be best to keep recovery periods relatively short to maintain a high oxygen uptake in the recovery period. Though, since it is an interval with an intensity below threshold power, you will quicker reach you target oxygen uptake than when you train e.g. VO2 max intervals. Thus, I would suggest you try to just take the recovery period you need and start the next interval when your legs and mind are ready for it. 5-7minutes would probably be fine, but some riders will prefer more recovery. Jesper, just to say in response to your last post that I very much enjoyed this one. Indeed I have just started training using your 5x 40/20 sec intervals at 90/50% Vo2 max. Interesting although this averages out at 77% Vo2 max my HR when doing these intervals never gets as high as an equivalent 5 mins at even 75%. Is this normal? Hi. i have a hill here that i do sometimes, it’s 2km and it takes me 9 mins, i do it in a big gear(for me), i do it 2 times, it’s a pretty hard effort, speccialy in the end, is this a good way to improve thereshold? It seems to me that most training sessions are purposefully designed to focus on a certain intensity. For example, Tuesday’s session will be at Threshold intensity, Thursday’s will be VO2, Sunday’s will be Aerobic. This is how I have trained for several years now. And, I feel I have trained myself to be good at that (as good as my natural abilities will allow, which isn’t much). However, here’s where things fall apart for me. I’m pushing myself to stay with a fast group staying in my Threshold range then I need to go into VO2 range for a short climb or attack. I cannot after this burst go back to maintaining a threshold effort. I need to go into a recover pace. I think because that’s how I train. VO2 intervals are separated by rest periods. Does it make any sense to have sessions that are Threshold intensity intervals with VO2 bursts? Actually, it isn’t necessary to do long rides of 6hours? Only in winter and once a week to be able to make the km’s? And stimulate your fat metabolism? So, if I understand it good, you just have to improve your treshold power to be a better cyclist by doing treshold intervals, subtreshold intervals,… because they are the most effective? So many pro-riders who train ” à l’ancienne” and do jut a lot of km’s, won’t reach their physical abilities? i’m 19 years old, non-competitive but i’m riding for almost 2 years. It’s good enough? Now it will certaintly increased, because then, I was almost non-trained… Just some running on school, where I was also one of the best… Can I even become a pro cyclist? I did a lot of km’s. Also this summer, training rides of 4h , 4hu45, 5h.. But in these 2 years nothing of intensity. So my question is, can i start my winter preparation directly with sub treshold intervals? If i do 2 (or one?) long endurance rides in the week, and for the rest sub treshold, treshold intervals,…; are these endurance rides enough? Can you give me some tips to create a training plan? I also want to say, that i do, i want to do and will do everything for it! I have had a few seasons off the bike. How much of a base in terms of miles and hours would I need to put under my belt, before starting this type of interval training. At present I can comfortably cover 80-100kms at 17/18 mph twice a week. 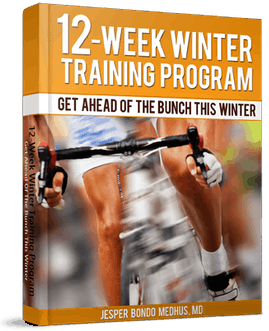 I just downloaded your 12-Week Winter Training Program and find myself really jazzed to get started. Coming off one of my best seasons after two major medical events I’m anxious to hit the ground running … or, rather biking next Spring. One question; what is the protocol for a 30 minute max test using only a heart rate monitor or is this type of test only for power meters? If so, what is your recommendation to determine a base line max level using only HR that I can check against at the end of the 12 weeks? 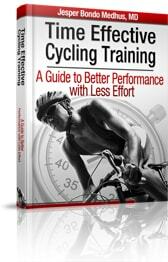 The book assumes a 10 hour window of training per week. By the way I fully subscribe to the quality vs quantity idea. The ’12-Week Winter Training Program’ is based on a weekly training volume of up to 10 hours per week. Actually, all weeks except week #12 is less than 10 hours per week. Also, it is easy to customize the training program so it fits perfectly. Some riders prefer to train more and other riders prefer to train less. That’s one of the strengths of this training program because all riders get interval training based on their current fitness and a training volume they can consume. Look forward to checking it out and applying it to my plan. Jesper, I’ve designed my next month of workouts above and just below my FTP. I have 4 interval workouts, the lower the intensity the longer the interval. What is the proper order to run these in throughout the week? Higher intensity to lower or lower intensity to higher? And why? Thanks! On the 27th of March my 20min was 270 (NP). On Saturday my 30min while out for a tempo spin + few hard efforts (but short) was 282. Entire spin with warm up 7 cool down was 250 NP (1h30). I’m sure by the way I feel that threshold has moved & I’ll do a test in the next week or so but would you suspect the same based on the above ? I’m a 40-something *amateur* new to racing who has had great triathlon training results in the past using a HRM. I’m focused on cycling now and am looking at using power instead of HRM. I’m also keen to avoid the cost and physical limitations of buying a PowerTap or other ‘hardware’ solution. Looking for comments on the effectiveness of Ciclosport HAC6 or iNewton power meters. Thanks! Hello, is it enough me to improve my time trial speed that i train only by interval trainings? Vo2 and threshold interval, so 85+% of my pulse. during a week I have 2 day for rest, 1 day for VO2 training 2 for treshold and 2 for subthreshold. Should i make long distance too with 80% pulse? Thanks Jesper ! Nice article with lot of usefull information. I like that concentrated type of information. I like your work. I am also interested what are the most important limiting factors when trying to develop sufficiant Treshold power (to not get droped before the finishing line)? Is someone with type I muscles more likely to develop high(er) treshold power that someone with type IIb mucles? With other words, what can one expect with more ‘sprinters like’ type of muscles?